Whoops! 55 reminders you forgot to PAINT your pregnant belly. You're welcome. Whoops! 55 reminders you forgot to PAINT your pregnant belly. You’re welcome. When we stumbled across this compelling video on YouTube, it reminded us that not only are pregnant bellies beautiful, but that to some people, they are the perfect canvas for dolphins, fairies, pandas and butterflies! Who knew? Belly art is another chapter in the general body fancying-up story and this speedy video tour of fifty painted bumps shows that, not only are lots of women keen to add a little something-something to their belly, but that the popularity of giraffes, hearts and rainbows should never be underestimated! Others feel the same. Sara’s project involved some pretty famous faces (and bellies) getting artsy for a really worthy cause (think Molly Sims, Milla Jovovich, Alyssa Milano and Kate Winslet), but the non-celeb set’s love of a fancy belly isn’t waning, either. Regular folk are taking inspiration form Sara’s book – and photos on #thebellyartproject Instagram tag – and boldly letting clever artists loose with paint and brush. The results are pretty jaw-dropping! 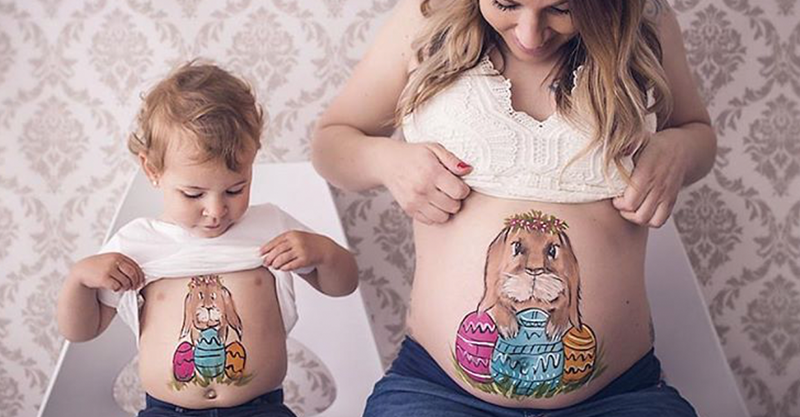 If you are loving this reminder that pregnant tummies can be works of art and are keen to commission your own fancy-fronted piece, a quick search of ‘face and body art’ in your area should reveal some clever artisans ready to make your belly dreams come true! We found Ambah (Victoria), Spark Face and Body Art (SA) and Making Faces (NSW) for starters. The #bellyart tag on Insta should provide heaps of helpful inspiration, if you’re stuck for ideas, too! Would you ever get your pregnant belly fancied up, like this?